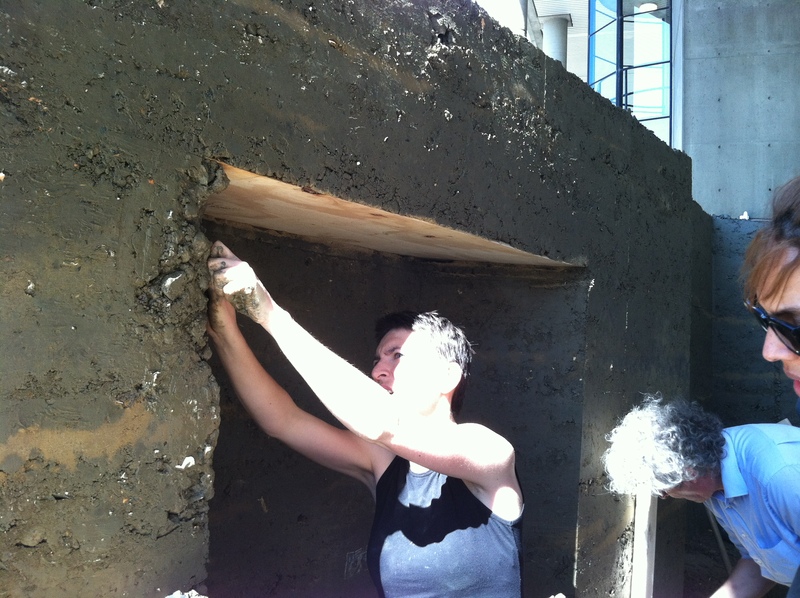 Mud Hall | Rammed earth construction at Harvard’s Graduate School of Design. 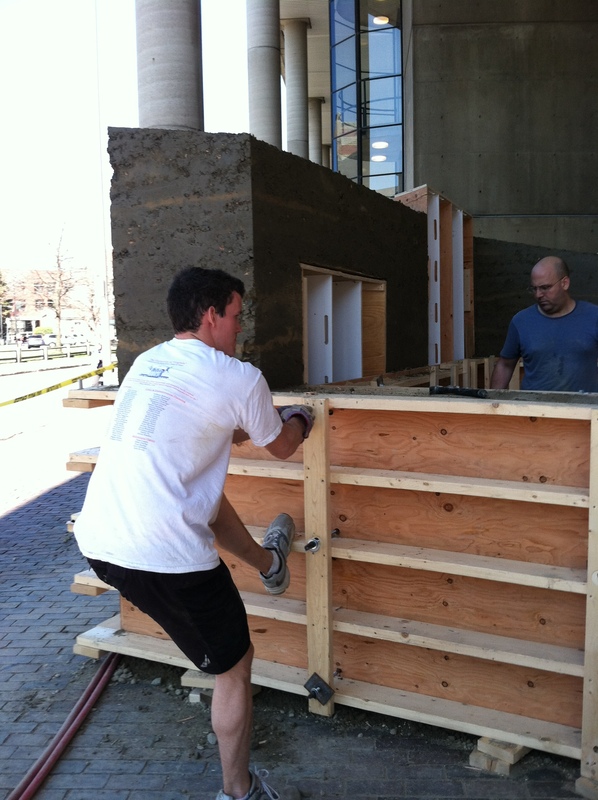 Mud Hall Rammed earth construction at Harvard’s Graduate School of Design. Last, but not least, Tom Stoelker of Architects Newspaper filed this report. MudWorks proved itself as a party place Friday night during the opening reception for the installation and accompanying exhibit in Gund Hall. 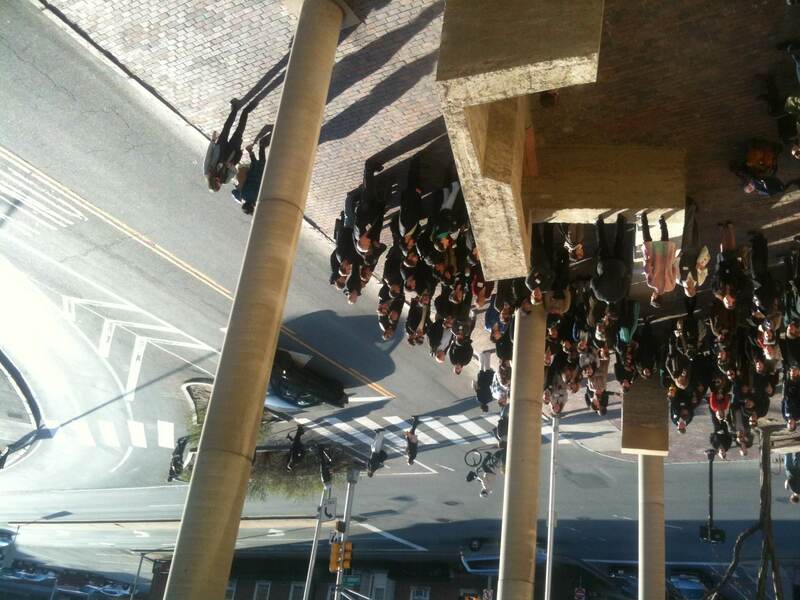 The true test of a public space is how it handles a crowd. Below are comments from Nick Rivard’s remarks. Hello. I am Nicolas Rivard, a first year Urban Design student. This project has offered us all a much needed chance to get our hands dirty, and we are happy that many of you have embraced that opportunity. is adapted on site to limitations unforeseen in the studio. 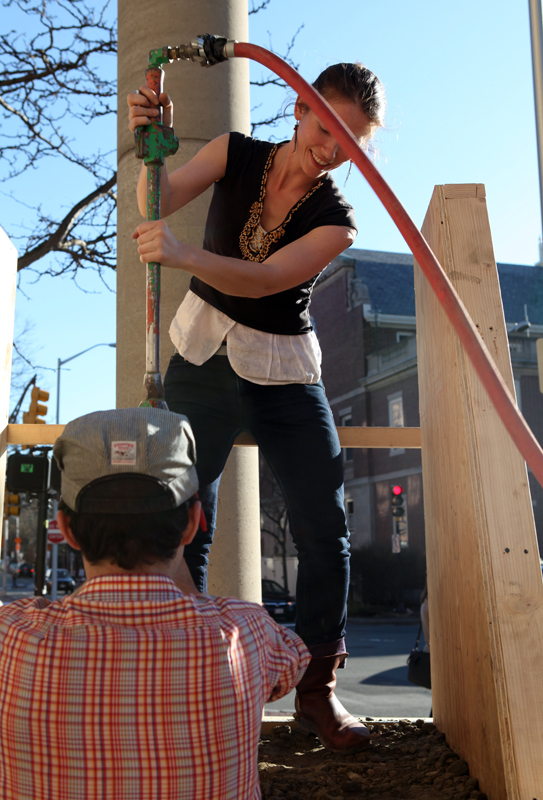 tools offers incredible potential, it can also distance us from the physicality inherent to building. Earthen construction is visceral enough to dissolve this rift more quickly than any other form of construction. And as we continue to pursue design excellence in our research and professional practices, it is imperative that we engage this portion of our professional territory. by saying thank you to everyone who made it possible. Thanks. 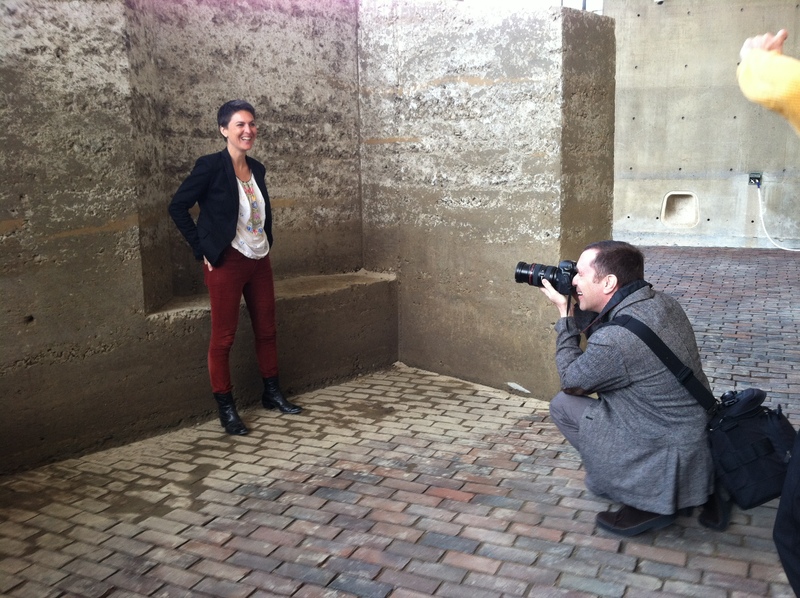 I photographed the dashing, peripatetic Iwan Baan photographing MudWorks yesterday. He’ll give a talk at noon today in Gund Hall, room 122. MudWorks’ fame is already beginning to spread. On Monday, reporter Tom Stoelker from the Architect’s Newspaper was at the GSD to interview Anna Heringer and Urban Design student Nick Rivard about the project’s implications for rammed earth construction. That story is supposed to appear in print April 7, but may show up earlier on the website. Meanwhile, a Boston website, Futures + Design has scooped everyone. There’s still more too come: On Thursday, the renowned architectural photographer Iwan Baan will be at the GSD to document MudWorks. Baan, who will also be giving a talk at midday, has photographed the work of nearly every significant contemporary architect – from Herzog & DeMeuron to Koolhaas. 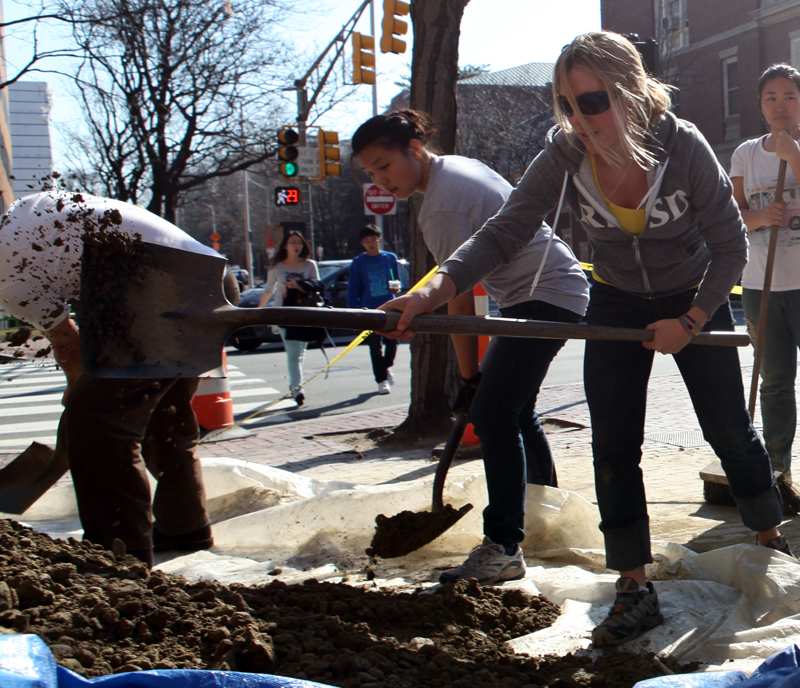 Volunteers are needed to help with last minute details so MudWorks looks its best. If only there was a way to clean up the weird shadows under the Gund Hall canopy. The MudWorks wall and sail have mellowed to an elephant gray since the forms began coming off on Thursday, but the project isn’t done yet. Lots of finishing details remain. GSD student Nick Rivard, a furniture maker in the Urban Design program, will be in the wood shop fashioning smooth bench seats out of redwood. 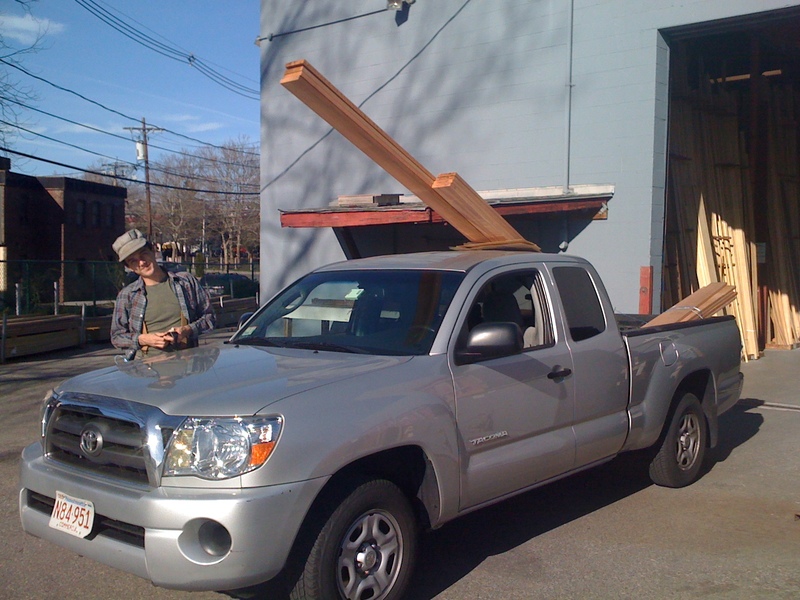 He and Loeb Fellow Anne-Marie Lubenau took off in a pick-up truck from Zipcar over the weekend to purchase supplies at a nearby lumber yard. In other news, the MudHall blog is starting to see some serious online traffic. 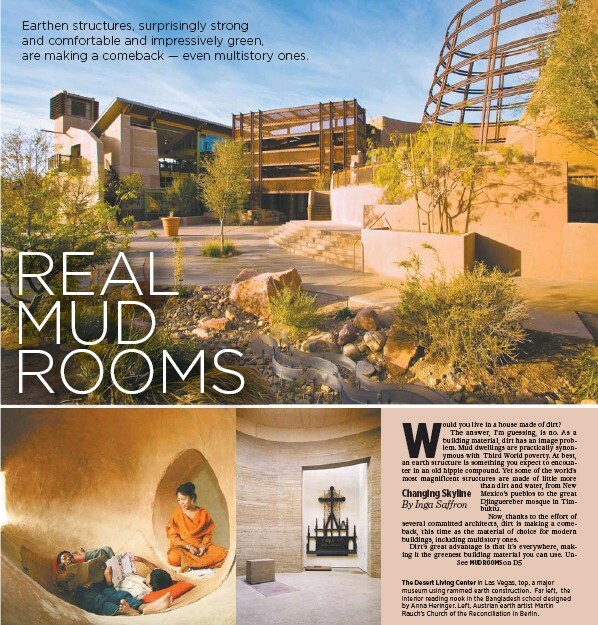 The rammed earth project has caught the attention of the Architect’s Newspaper, which is sending a reporter to Harvard today to write about the project. It was time for MudWorks to emerge from its wooden cocoon. The earth in the main wall had been packed and rammed and packed again, so just after midday on Thursday designers Anna Heringer and Martin Rauch gave the word to take down the forms. Loeb Jean Brownhill Lauer, Loeb affilliate James Lauer, and GSD student Alex Myer started gingerly prying off the boards. The forms proved a bit stubborn, so it was clear more force was needed. With the help of drills, makeshift levers and brute strength, they began removing the plywood that had been holding the mud in place for six days. It was as if they’d just uncovered a buried treasure. The wet, glistening black mud was perfectly formed, with sharp, creased corners. With the wooden shroud gone, it was possible to see the work of a 100 volunteers made visible. Orange streaks surged through the black mud, giving it the look of a geological formation. Volunteer Sarah Kantrowitz, who traveled from New York to work on the project, picked out “the eyes,” – the pine knots imprinted from the plywood. 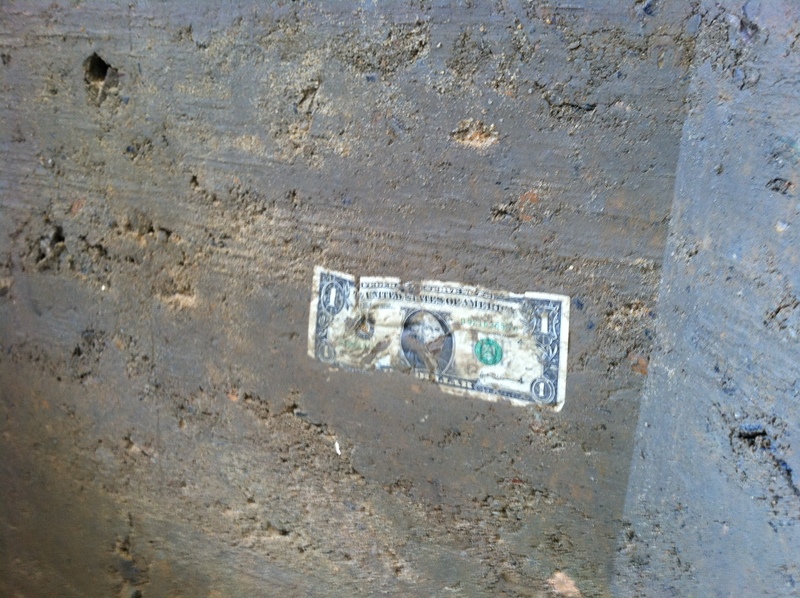 A dollar bill had somehow become wedged in one of the seating niches. No one claimed it, so it looks like it’s there to stay. There were a few minor causalities in the course of taking down the forms. Some dirt broke off one corner and had to be repaired. But it was easy for Jean and Anna to patch by packing on wet mud by hand. It was important to hurry, though. Within the next few hours, the mud began to dry. By early evening it had turned from black to a soft, pachyderm gray. That’s natural. 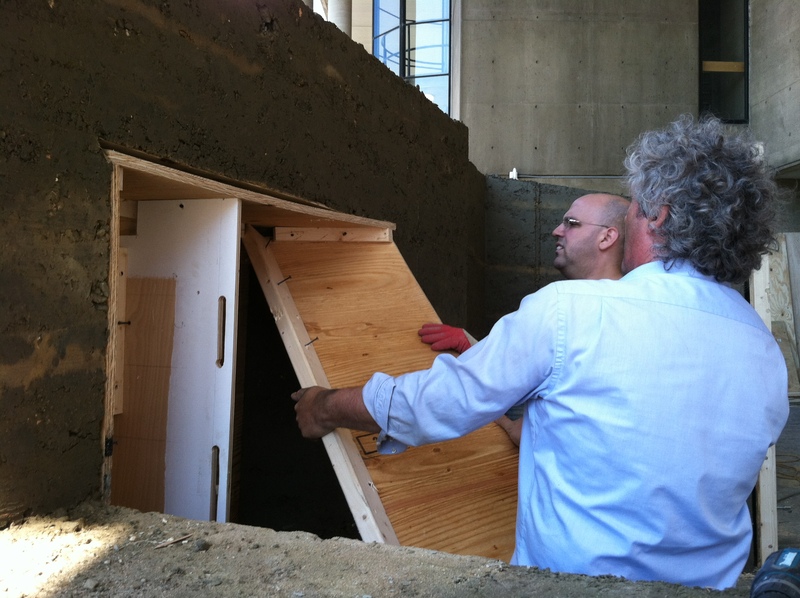 One of the great things about rammed earth is that the material continually evolves. 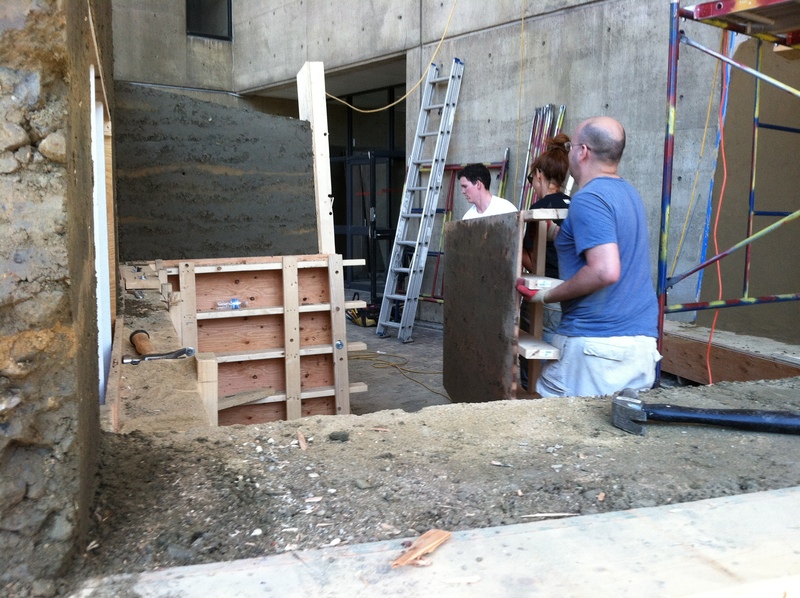 What a contrast to see the rich, textured mud against the stony concrete of Gund Hall. The timing of the work couldn’t have been more perfect. MudWorks was revealed just in time for Anna and Martin to give their lectures on rammed earth construction in the GSD’s Piper Hall. Four students volunteers also talked about their participation in the design and construction of the project: Caroline James, Alex Myers, Nick Rivard, Catinca Dobrescu. 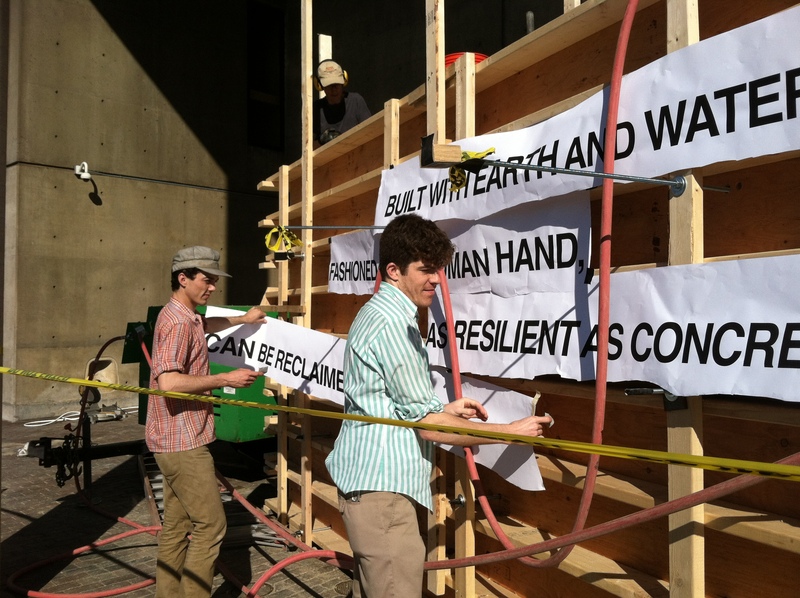 The project, Alex told the audience, “has already democratized the site.” Passersby were stopping constantly to ask students questions about rammed earth. Not only had MudWorks improved the appearance of Gund Hall’s least attractive corner, it had become a way for architects to reach out to the wider world. What does a wall want to say? 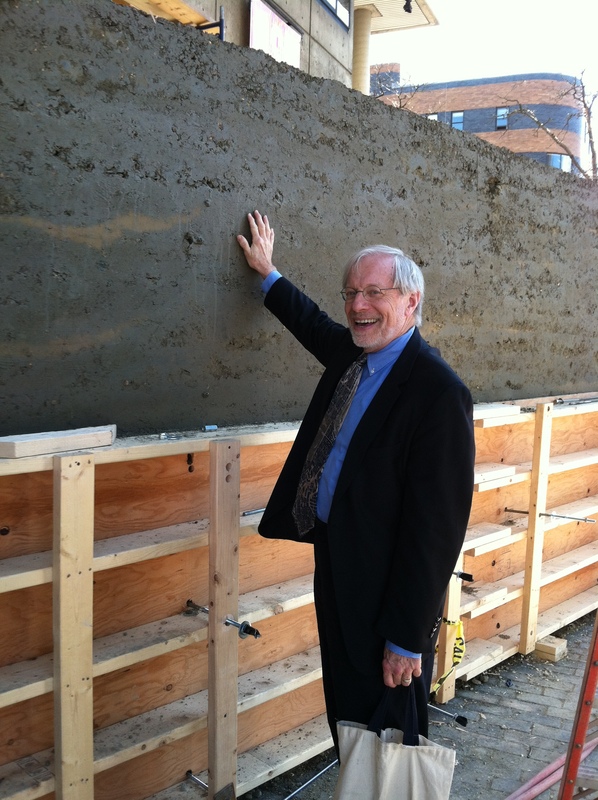 Mud is an extremely expressive construction material, and the MudWorks project is already making a strong statement on the busy corner of Quincy and Cambridge Streets. 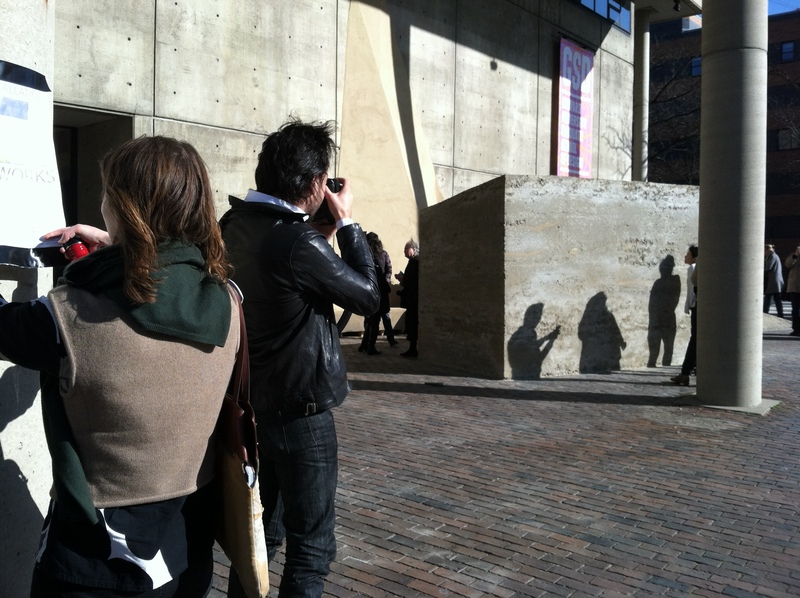 Still, the rammed earth wall can’t say everything that needs to be said about the project. It needs an inscription. Built with EARTH and WATER. Fashioned by the human HAND. This wall can be reclaimed by NATURE. But after some discussion, we decided that it was actually too prominent, and took away from the main event, the mud wall. Oscar went back to his computer and designed a new version that will wrap around the base in a single, continuous line. The plan is to engrave the letters into the mud. That means volunteers will have to work fast. Because so many volunteers have come out to help in the last two days, work has gone very fast. 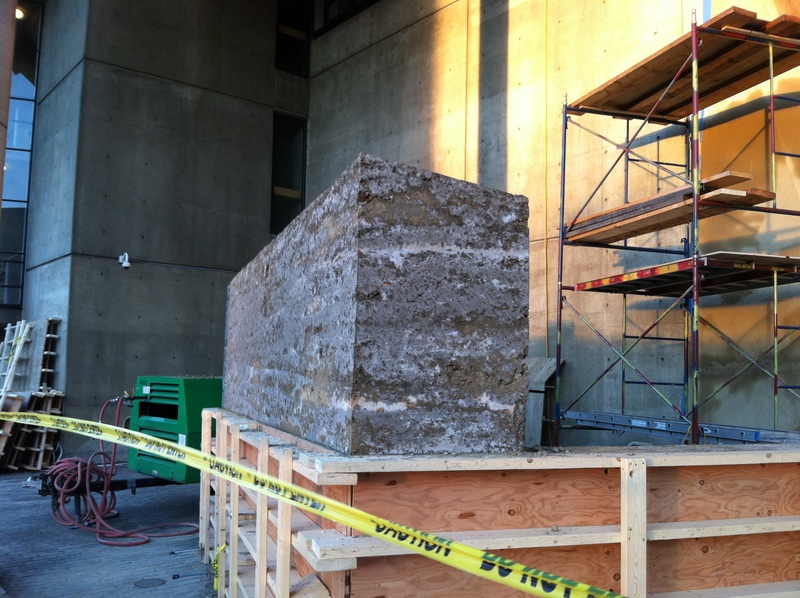 The MudWorks crew expects to begin taking off the wooden forms from the main wall today.